Editor’s Note (10/5/18): From a relatively young age, Doris Tsao distinguished herself as a leading scientist investigating the way the brain recognizes faces. On October 4 the John D. and Catherine T. MacArthur Foundation recognized Tsao by giving her one its 25 fellowships (“genius” awards) for 2018 ($625,000 allocated over the next five years). In doing so, the foundation acknowledged: “her most notable line of research has focused on uncovering the fundamental neural principles that underlie one of the brain’s most highly specialized and socially important tasks—recognizing a face.” A news item published last year on Tsao's work on the neural code for faces follows. 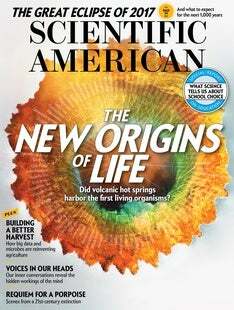 Stay tuned in coming months for an article by Tsao on face recognition in Scientific American. The brain has evolved to recognize and remember many different faces. We can instantly identify a friend’s countenance among dozens in a crowded restaurant or on a busy street. And a brief glance tells us whether that person is excited or angry, happy or sad. Brain-imaging studies have revealed that several blueberry-size regions in the temporal lobe—the area under the temple—specialize in responding to faces. Neuroscientists call these areas “face patches.” But neither brain scans nor clinical studies of patients with implanted electrodes explained exactly how the cells in these patches work. Previous studies had hinted at the specificity of these brain areas for encoding faces. In the early 2000s, when Tsao was a postdoctoral researcher at Harvard Medical School, she and electrophysiologist Winrich Freiwald showed that neurons in a monkey’s face patches would fire electrical signals every time the animal saw pictures of a face. But the same brain cells showed little or no response to other objects, such as images of vegetables, radios or nonfacial body parts. Other experiments indicated that neurons in these regions could also distinguish among individual faces, even if they were cartoons. To decipher how cells perform this recognition task, Tsao and postdoc Steven Le Chang generated 2,000 human mug shots with variations in 50 features, including facial roundness, distance between the eyes, and skin tone and texture. They showed these images to two monkeys while recording electrical activity from individual neurons in three separate face patches in both animals. Each neuron responded to only a single feature, the researchers found. Rather than encoding individuals’ faces, like the Jennifer Aniston neuron in the hippocampus, the face patch neurons were dividing images into smaller regions and encoding specific features such as hairline width, Chang says. Moreover, the neurons in separate face patches processed complementary information. Like factory workers, the various face patches had distinct jobs, cooperating, communicating and building on one another to provide a complete picture. Once Chang and Tsao knew how this division of labor occurred, they could predict the neurons’ responses to a completely novel face. They developed a mathematical model in which facial features were encoded by various neurons. Then they showed monkeys a previously unseen image of a human face (1). Using their algorithm for how various neurons would respond, the researchers were able to digitally re-create the visage that a monkey had viewed (2). “The re-creations were stunningly accurate,” Tsao says. In fact, they were nearly indistinguishable from the actual pictures the monkeys saw. Even more surprisingly, the researchers needed readings from only a relatively small set of neurons for the algorithm to accurately re-create the faces monkeys were seeing, Tsao says. Recordings from just 205 cells—106 in one patch and 99 in another—were enough. “It really speaks to how compact and efficient this feature-based neural code is,” she says. It may also explain why primates are so good at facial recognition and how we can potentially distinguish among billions of different people without needing an equally massive number of face cells. The findings, which were published recently in Cell, provide scientists with a comprehensive, systematic model for how the brain perceives faces. This human cerebral machinery is very similar to that of monkeys, and we have face patches that respond like theirs to images in functional MRI studies, according to researchers. Yet the number of human face patches might differ.